ABCs, 123s, red, blue, green, and yellow! These are the least of skills one kindergarten teacher believes all children should know upon entering her class. “I would expect a student to know his name, how to spell and recognize it, know the alphabet, letter names, numbers one to ten, colors, and shapes,” stated D’ Angela Keys, a kindergarten teacher with the Achievement School District. Kids are expected to know or to have had some exposure to these skills when they enter kindergarten on day one. However, that is not the case for many students. Keys has found herself spending great amounts of time on name recognition and spelling and alphabet recognition and sounds with many of her kindergartners. In Keys class, 100 percent of the students are growing up in poverty. This means academically the odds are against them because they may not have had access to resources needed to develop a solid foundation to be successful learners. Growing up in poverty means families may have to worry about basic necessities for survival including housing, meals, and healthcare. This may cause families, though not intentionally, to neglect providing a child with the skills needed to progress as successful learners. In the early stages of life, children need to be exposed to reading and to books. They need to be talked to which helps increase their vocabulary. They need to interact with peers to develop social skills. Children that do not have these experiences risk entering kindergarten with social, behavior, and academic deficits causing them to fall behind their more affluent peers; thus, widening the achievement gap. When a child enters kindergarten lacking the necessary skills to be successful, it becomes difficult to move him or her forward. When a teacher gets a child who cannot express himself or herself because of limited vocabulary or a child who does not know how to follow directions or positively interact with his or her peers, it affects her ability to teach the kindergarten curriculum because she has to help build the foundation that should have been built before entering kindergarten. Ms. Keys stated that she notices a difference between students who have had access to some type of quality pre-kindergarten experience and those who have not. “If the student attended an effective pre-K program then there is a difference between him or her and the students that did not. I also saw more success with students who had parents that really invested a lot of time and energy into their child’s future,” says Keys. From my experience, students who have positive developmental experiences have a higher vocabulary, are more able to follow directions, are more confident, and have the ability to soar high. I worry about students who are behind. They have a higher chance of being referred to special education, performing low on achievement tests, and falling further and further behind which could lead to dropping out of high school. I remember explaining to a voter why she should support a sales tax increase that would provide funds for children in Memphis to attend pre-K. I told her to view it as an investment in public education in our city. I assured her that she would much rather pay a little extra in taxes now to provide an underprivileged child with a quality education than to pay for it later when she’s paying for that child to receive public benefits or if she happens to be a victim of a criminal act committed by that child. It is important for citizens to understand that education helps eradicate poverty and if we invest in pre-K we are implementing a preventative measure. This preventative measure will work toward providing opportunities and resources to our children that will ameliorate their future living conditions. Investing in pre-K will help close the achievement gap, increase the graduation rate, create productive citizens, and make Memphis a city where all children have access to a quality education. We must be pro-active and not reactive. We must be proponents for our children and do what is necessary to ensure that they receive a quality education beginning with an effective pre-K program and ending with a high school diploma, prepared for and with access to a high education institution. Below are quotes directly from pre-K and kindergarten teachers explaining the importance of a quality pre-kindergarten program. “Students who are given the advantage of attending a pre-K program develop much needed emotional, academic, and social skills they may otherwise lack when entering kindergarten. Students who develop self-regulation skills gain confidence as they master academic concepts, and learn to cooperate with their peers in pre-K will be far better prepared to enter kindergarten. This is particularly true for students who are already at a disadvantage in any or all of these areas, which is often the case with the current optional pre-K system.” – Bethanie Moore, Achievement School District, Memphis. “Pre-K is so so important because this early in the game, students’ brains are spongy. They’re ready to soak up all you have to offer and you get a fresh start with kids and are able to foster a love for school and learning. Everyone should have access to pre-K. 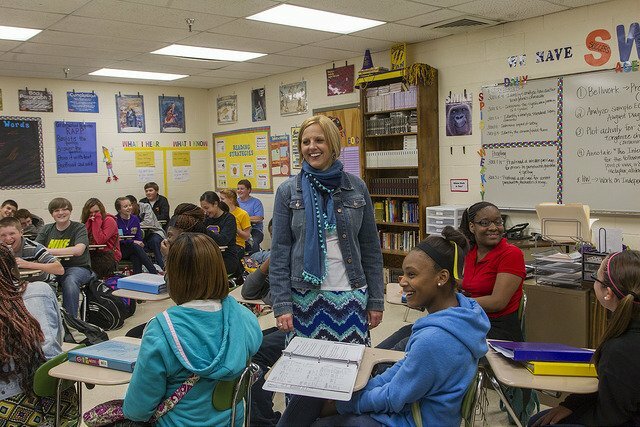 It makes all the difference in a child’s education.” – Meagan Fowler, Achievement School District, Memphis. “Pre-K is important because it provides a great foundation for kindergarten, It also exposes children to an educational environment. Many students need that extra year to become accustomed to a classroom and learn how to play with other children. Pre-K gives children a chance to develop and grow while also learning skills needed to be successful for the rest of their lives.” – D’ Angela Keys, Achievement School District, Memphis. A version of this blog was originally posted at bluffcityed.com on September 24, 2013.